In large bowl, dissolve yeast and sugar in warm water. Let stand 5 minutes. Add semolina, salt, and oil. Beat at medium speed with a mixer until smooth. Stir in 2 cups of unbleached white flour to form a soft dough. Turn dough out onto a lightly floured surface. Knead until smooth and elastic (about 10 minutes). Add enough remaining flour, one tablespoon at a time, to prevent the dough from sticking to your hands. Place the dough in a large bowl. Cover and let rise in a warm place (85 degrees) for 45 minutes or until doubled in bulk. Punch dough down and divide in half. Roll each portion into an 11 x 7 inch rectangle. Spread 3 tablespoons of Basil Pesto on the rectangle, leaving a ½ inch margin around the edges. I before I spread my pesto on the bread, I add 3 tablespoons of olive oil and add 2 tablespoons Parmesan cheese. Roll up each rectangle, starting with a long edge, pressing firmly to eliminate air pockets. Pinch seam and ends to seal. 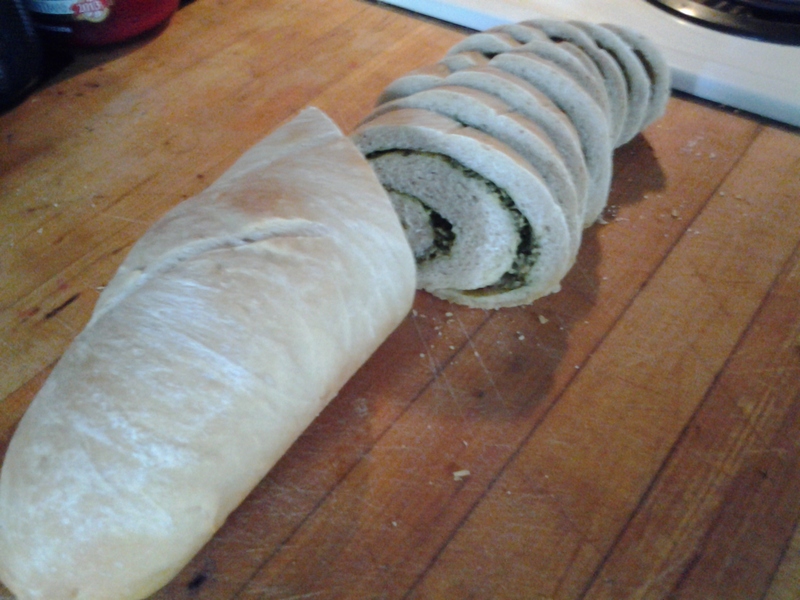 Place rolls, seam side down, in a baguette pan (a French bread pan) or on a cookie sheet coated with cooking spray. Cover and let rise 45 minutes or until doubled in bulk. Bake at 350 degrees for 35 minutes or until loaves sound hollow when tapped. Remove from the pan and let cool on wire racks. Yield: 2 loaves. * If I don’t have semolina flour I substitute unbleached white flour. **You can purchase pesto although the taste is not as good as my home made. In case you missed my recipe for home made pesto last week, I’ve posted it below. For a delicious sandwich, put pulled pork (recipe appeared two weeks ago) on this bread when the bread is hot out of the oven. I like to add sweet pickle relish to top off the pulled pork.